A new batch of pendrive sized Mini PC Android computers is here! We’ve seen it coming … and just as predicted it seems that these chinese guys started churning out a whole range of Mini PC Android computers. This time we find two new USB sized Android PC models from what seems to be the same company to have given birth to the early MK802 Android on PC. The first Mini PC Android it’s priced at U$S 76 (at the time of this writing) and includes a Dual Core Cortex A9 Renesas processor, while the second one includes a single core AllWinner A10 Cortex A8 processor, priced at a slightly less price. Both of them comes enclosed with a rather bulky casing, but still under the pendrive size format. They both include 1Gb of DDR3 RAM, a normal sized HDMI MALE Output (this is the first time we see a normal MALE sized HDMI in a Mini PC Android), external mic input and internal MIC. They include WIFI b/g/n and a microSD slot compatible with up to 64gb microsdhc cards. And of course, the Mini PC Android comes preloaded with Android 4 OS. The Male HDMI will allow you to connect the Mini PC Android directly into the back of the TV. The Mini PC Android will get its power from a mini USB connector (a mini USB to standard USB cable is included). 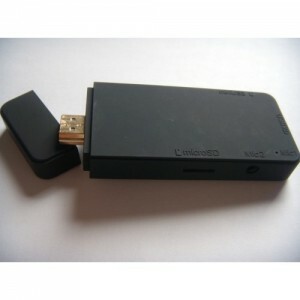 It also includes a standard female OTG USB connector which will allow you to hook an USB keyboard and mouse into the Mini PC Android. I don’t think all andro sticks trend is mature enough to be in serious devices classification! -Ask android developers/upper-users a wish list, a survey. -Use SOC tech as possible with all in one featured functions! -Want some more really nice ideas let me know if you are interested.